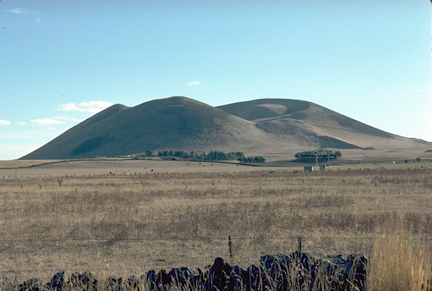 Derrinallum is located 176Km west of Melbourne at the foot of Mt Elephant which is the dominant feature of the landscape. An image of Mt Elephant is at left. The town was named Tooliorook until 1873. Derrinallum G C Wilson (Agent) and later "Sub." 1934-06-30 & later Reports "Sub." removed. Branch was closed as a wartime measure (from Current Accounts January 1963). A major conflagration swept through the town in 1944 destroying most of the buildings. The fire reached the wall of the ex-branch, severely blistering the paint, but it survived. Information provided by John Scott, son of the 1939 buyers of the branch to Geoff Chapman who sourced the Google photos. 2011 March: Geoff Chapman forwarded Google Earth image is ex-CBC branch & residence Derrinallum Victoria. 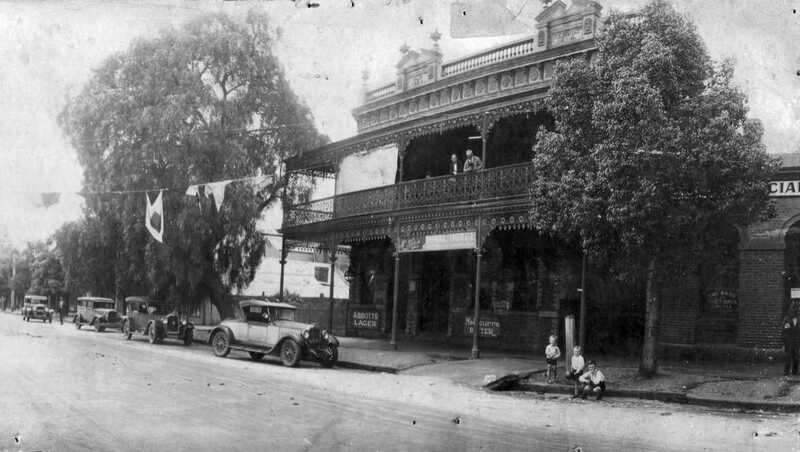 2007 1924 photo of The Bank of Victoria Limited, Donald with John Lee Bales Snr in the centre on the front step. 1956 photos by Kevin Greenaway. 2007 photo also by Kevin Greenaway who says: "During a visit to Victoria I recently called at Donald and photographed the NAB there which was the old CBC building. Makes a nice comparison to the photo I took there over 50 years ago." 2009 November 20 NAB branch closing. Advised by Barry Collier of Donald. 2009 Early photo of Drouin sourced by Geoff Chapman. 1856 the Bank of Victoria opened in a small building on part of 92 Broadway. 1860 Bank of Victoria closed at 92 Broadway. 1861 photo on broken glass from the Dunolly Goldfields Museum collection reveals that the Bank of Australasia was converted to CBC . 1858 New premises for that bank were erected, at 72 Broadway, and occupied on 30/12/1858. 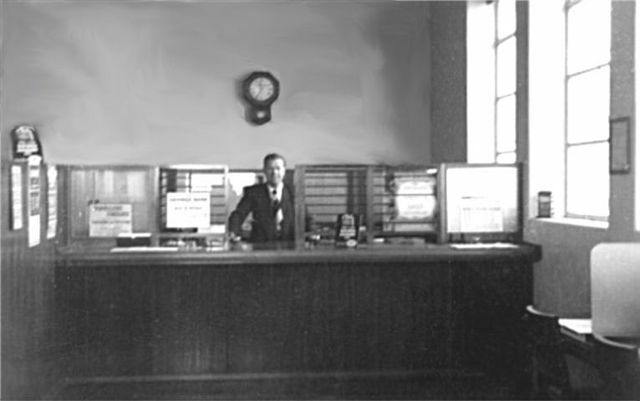 1865 When the Bank of Australasia closed its Dunnolly branch , Bank of Victoria opened an Agency (Of Maryborough Branch) in that Bank's vacated premises. This was at 72 Broadway. Notes by Geoff Chapman. In 1868 the agency became a branch in its own right. 1871 New brick premises were built on the site, which remained in use by Bank of Victoria and CBC until 1958. Building costs were estimated at £26,000. 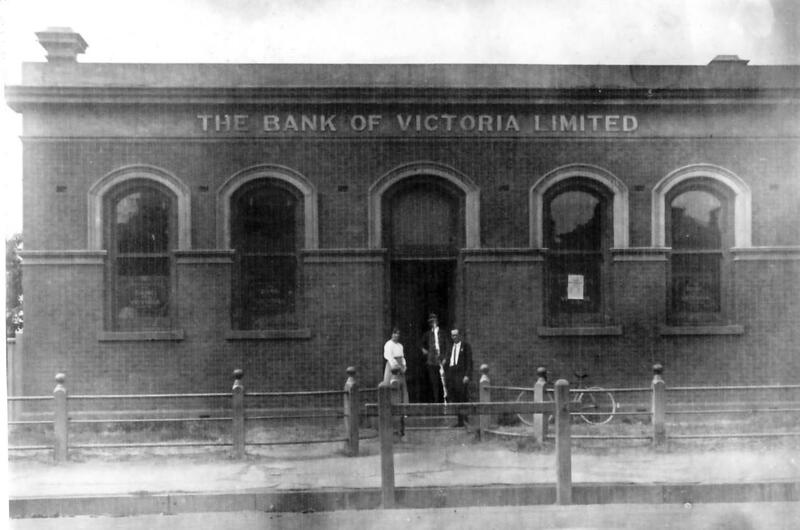 1895-c1910 photo of Bank of Victoria photo from Dunolly Goldfields Museum collection. 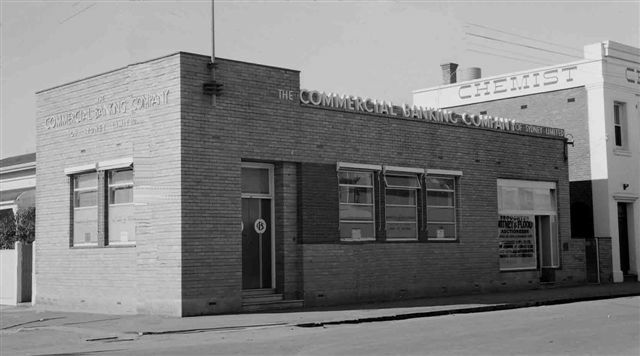 1927 The Bank of Victoria was amalgamated with CBC. 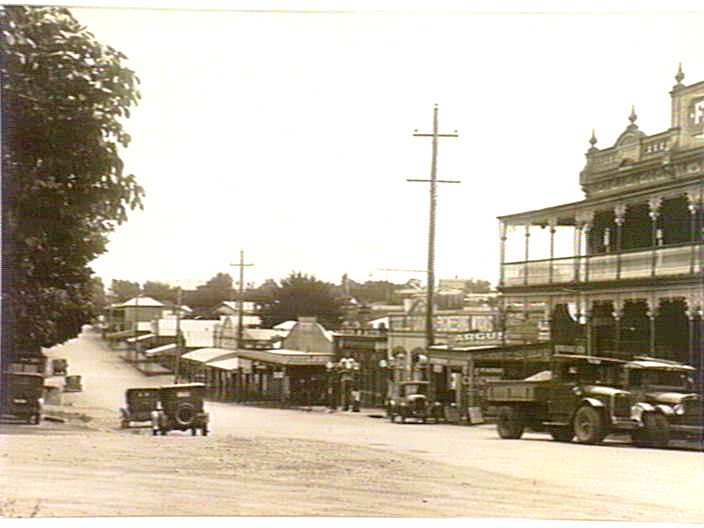 1932 photo as CBC from the Dunolly Goldfields Museum collection. 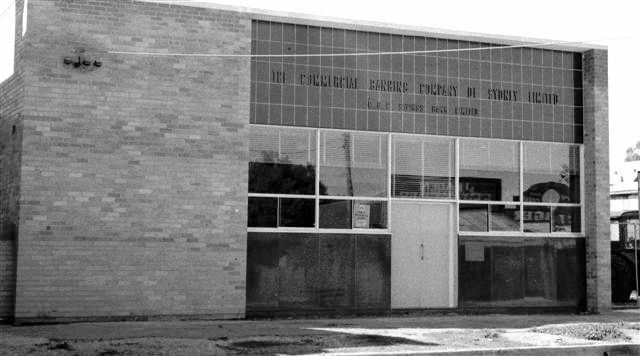 1958 The old building was demolished and a new building erected. 1998 The branch (then nab) closed on 19th December. Click here for MS Word document on the bank at Dunolly. There is no photo of the original Bank of Victoria 1856-1860 at 92 Broadway, Dunolly. The Bank of Australasia photo 1861 is the building that became the Bank of Victoria from 1865-1871. 2009 September Geoff Chapman forwarded Google Earth image of ex-CBC premises built 1958 at 72 Broadway, that being the site of Bank of Australasia from 30/12/1858, then Bank of Victoria, then CBC from 1927. 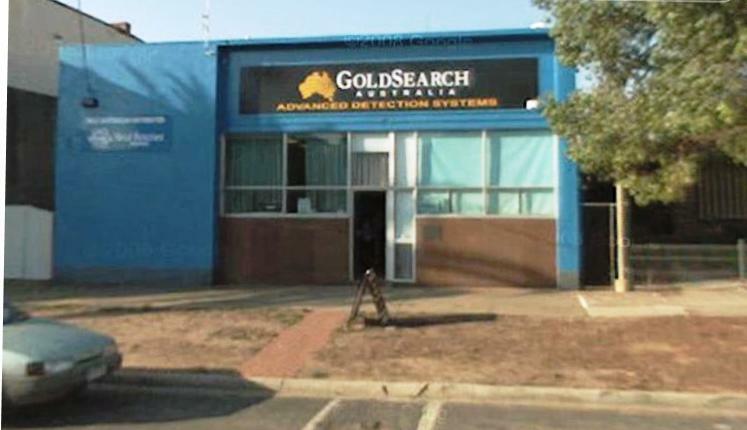 The premises have been slightly altered since rebuilt in 1958; now Goldsearch Australia.